There are second chances. After selling their Kahaluu Valley gallery garden 10 years ago and moving to the Big Island and Maui, artists Hiroshi Tagami and Michael Powell are back home in their original haven. Tagami had purchased the acre in Kahaluu 47 years ago with Richard Hart, bringing his knowledge of horticulture, endangered species and birds to create an oasis for the artists' galleries and studios. The successful gallery garden became a favorite landmark for residents and visitors who wanted to take home the art of Hawaii, as well as school children, seniors and rehabilitating patients who came to learn about art and to relax. After moving away, the two found they missed Oahu and their friends, and when they heard their old property was back on the market, it seemed like fate was calling. They moved in last October and will celebrate its grand reopening from 11 a.m. to 4 p.m. today and tomorrow, with art displays and jewelry sales, including antiques from Robyn Buntin of Honolulu and custom Tibetan rugs by Island Rug Co. 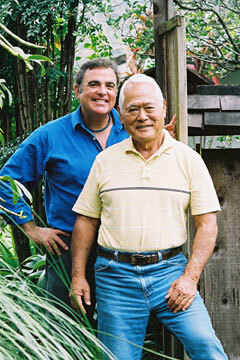 The Tagami & Powell Gallery Garden is at 47-754 Lamaula Road in Kaneohe. Call 239-8146 . Michael Powell, left, and Hiroshi Tagami are celebrating their move back to Kahaluu this weekend, with a grand opening celebration at their gallery garden. Keith Haugen's weekend "Music of Hawai'i" radio show on KIPO 89.3 FM will air a salute to Don Ho at 3 p.m. tomorrow. Haugen and his wife, Carmen, usually program only Hawaiian music, but Sunday's show will be an exception. "We'll play (his) music, old and new, Hawaiian and non-Hawaiian," Carmen said. KIPO can also be heard at www.hawaiipublicradio.org and on Oceanic Time Warner digital cable.